The first thing someone sees when they enter your home is your entry way or foyer. Yet this is often one of the most neglected areas of a home. It is set up once and forgotten. This often overlooked area is most likely in need of a bit of a refresh.Since this is the area that quite literally welcomes guests into your home, you may want to take the time to take a critical look at this area and determine if it is in need of a little refresh. First, go outside and entry your home as though you are a guest. What is the first thing that catches your eye? Is that a good thing or a not so good thing? Is the area cluttered? Is the area welcoming? Is the area inviting? Is the area clean? If the answer to any of these questions is no, then we have some work to do. If you did answer no, then the first thing you should do is empty out the area and clean it thoroughly. Then before you put anything back in, decide if you want to paint a new color (or remove wallpaper), add in any built-ins, change the flooring or anything else that would require the space to be empty. If you are unsure about what the possibilities may be, call Andy onCall® to go over some ideas with you and come up with a design that will transform your entryway from ho-hum to spectacular. Once The craftsmen at Andy onCall® have completed the refresh of your entryway, you will be able to add in any finishing touches you wish. A mirror, framed art, a bench or a hook for keys. Whatever little touches you want to add to create a warm welcoming and inviting environment for guests when they first arrive. 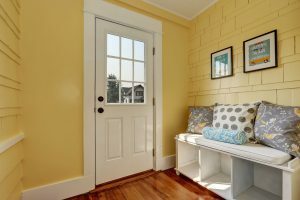 If you want to refresh your entryway in time for the Holidays be sure to call Andy onCall® right away as their schedule is booking up rapidly.